If making a mark outside the home turf halfway around the world were to be perceived as a breakthrough moment for startups, Blend -a group messaging app- seems to have reached a milestone. Despite being part of a crowded messaging app market, dominated by giants like WhatsApp and Slack, the San Francisco-based Blend has caught the attention of MENA’s investing community in its recent round of funding. Blend raised US$6.3 million in June 2015 in a Series-A round led by New Enterprise Associates (NEA), a round that also saw participation from Al Nowais Ventures. 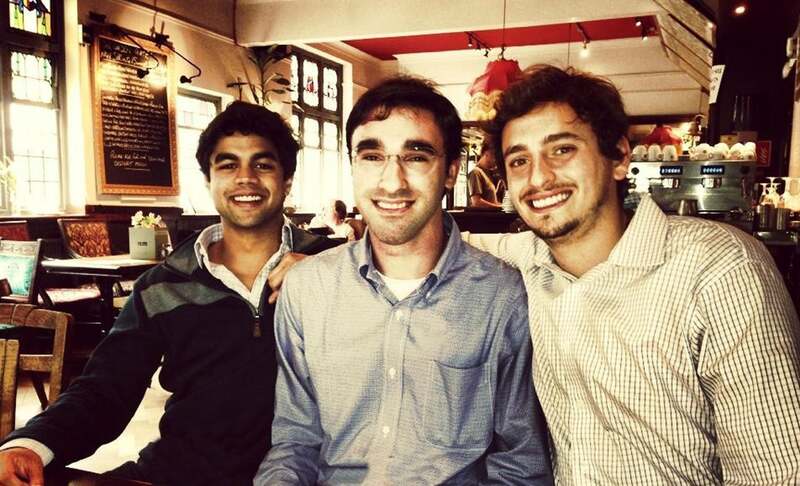 From Left to Right: Blend App co-founders Akash Nigam, Evan Rosenbaum and Matt Geiger. Image credit: Blend App. Launched in 2013 by three friends Akash Nigam, Evan Rosenbaum and Matt Geiger, Blend claims to have over 250,000 daily active users for its app, and is now 20 employees strong with offices in San Francisco, California and Bucharest, Romania. Blend started off as a trend/theme-based picture sharing app, mostly for college students, and it has since then pivoted into a messaging app going beyond peer-to-peer conversations, with a focus on “groups” including groups of friends, families, coworkers etc. The app considers Generation Z and millennial audiences as its core market and its user base includes high schoolers, fraternities/sororities at colleges, and fans of any “verified” (celebrity) Blend users. “Our cut and dry differentiator is the public groups,” Nigam says. “Public groups can only be created by verified users and are open to anyone. It’s a one stop shop for the respective celebrity’s fan base.” Notable verified users currently on Blend include singers Jack Johnson and Shawn Mendes, among others. The startup is highly focused on design and has a unique user-centric marketing approach. Blend studies aspects that drives users away from other messaging apps, models key features of Blend based on these factors, and then works on building prototypes to incorporate them. The marketing team also undertakes other innovative efforts, such as turning off spellcheck in the app for 72 hours, and analyzing data on the misspellings, which has earned them good media attention. In addition, the public groups feature also seems to be working in Blend’s favor. Verified users/celebrities from various fields drawn in their “fans" to the platform. Speaking of the app’s game plan for the future, Rosenbaum, co-founder and CPO, Blend, says they are currently developing “breakthrough experiences” for users. “We also have another big update coming later in the year that’s been receiving amazing feedback initial user studies,” he added. The app is currently pre-revenue, and hopes to pursue a native advertising model when the timing is right. What are your thoughts about the MENA tech startup ecosystem? Do you have any tips you can share with the MENA region's entrepreneurs who may look to you as inspiration? ROSENBAUM: Blend views MENA as one of the great upcoming areas for tech innovation. We are excited to be bringing our product to users across the Middle East, especially to those who may not be avid users of more multimedia rich messengers, like users are in North America. Our tips for entrepreneurs are, firstly, think lean, build lean, pivot lean. It’s tempting to overbuild and overcomplicate new companies, products, and features. We’ve learned that the best features are those which are simple for users to understand while being quick to build. This provides your company with the ability to pivot quickly and adjust to real users. Secondly, don’t delay launching [and] get your product to market quick. You will learn more than you ever expected once you have real users on your product; issues you may never have foreseen suddenly come to light. Third will be to focus on design- as Dieter Rams famously said, ‘Good design is no design.’ We live this at Blend. A product needs to feel so natural to its users that it feels like it isn’t designed at all. The hardest component of designing is figuring out what to remove, not what to add. Do you intend on building on the MENA region, both as a user base and as an investor potential? NIGAM: Absolutely, we expect to continually expand our MENA presence. Fortunately, this has been happening organically by direct virtue of the product’s viral nature. Our company believes that long-term sustainability is a direct result of cheap marketing and focusing on growth from within the product itself. Therefore, when we visit places like Dubai, rather than focusing on marketing ploys or efforts, we meet with a bunch of young users and mine for product feedback. Subsequently, we tailor the product roadmap with their feedback in mind. We’ve found this to be the golden path to our success.